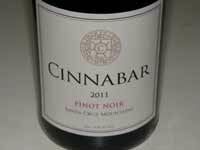 Cinnabar overlooks the Silicon Valley from the eastern rim of the Santa Cruz Mountains. Pinot Noir is produced from the Santa Cruz Mountains along with Cabernet Sauvignon and Chardonnay. Grapes are also sourced from Paso Robles and Monterey for other bottlings.